To be sure, the United States remains home to more Christians than any other country in the world, and a large majority of Americans – roughly seven-in-ten – continue to identify with some branch of the Christian faith.1 But the major new survey of more than 35,000 Americans by the Pew Research Center finds that the percentage of adults (ages 18 and older) who describe themselves as Christians has dropped by nearly eight percentage points in just seven years, from 78.4% in an equally massive Pew Research survey in 2007 to 70.6% in 2014. Over the same period, the percentage of Americans who are religiously unaffiliated – describing themselves as atheist, agnostic or “nothing in particular” – has jumped more than six points, from 16.1% to 22.8%. 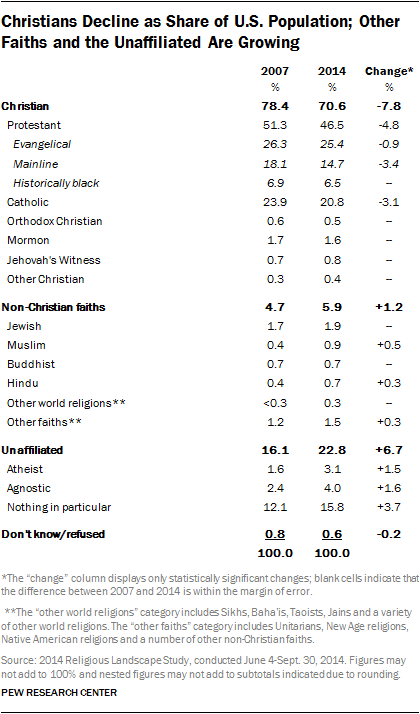 And the share of Americans who identify with non-Christian faiths also has inched up, rising 1.2 percentage points, from 4.7% in 2007 to 5.9% in 2014. Growth has been especially great among Muslims and Hindus, albeit from a very low base. 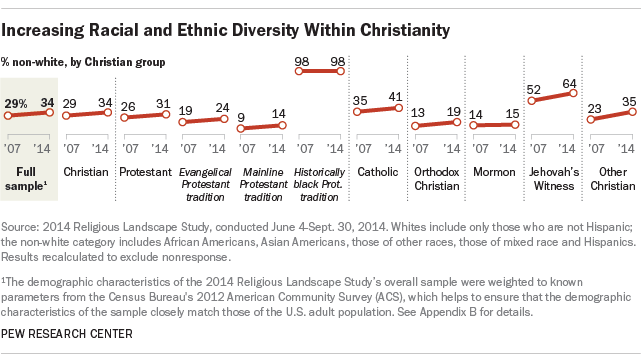 Even as their numbers decline, American Christians – like the U.S. population as a whole – are becoming more racially and ethnically diverse. Non-Hispanic whites now account for smaller shares of evangelical Protestants, mainline Protestants and Catholics than they did seven years earlier, while Hispanics have grown as a share of all three religious groups. 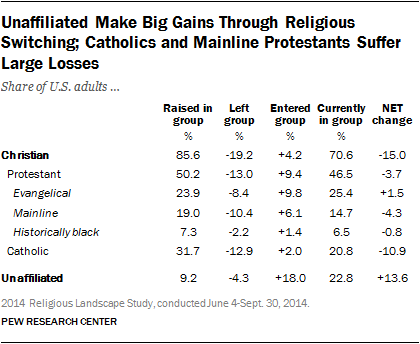 Racial and ethnic minorities now make up 41% of Catholics (up from 35% in 2007), 24% of evangelical Protestants (up from 19%) and 14% of mainline Protestants (up from 9%). Religious intermarriage also appears to be on the rise: Among Americans who have gotten married since 2010, nearly four-in-ten (39%) report that they are in religiously mixed marriages, compared with 19% among those who got married before 1960.3 The rise in intermarriage appears to be linked with the growth of the religiously unaffiliated population. Nearly one-in-five people surveyed who got married since 2010 are either religiously unaffiliated respondents who married a Christian spouse or Christians who married an unaffiliated spouse. By contrast, just 5% of people who got married before 1960 fit this profile. 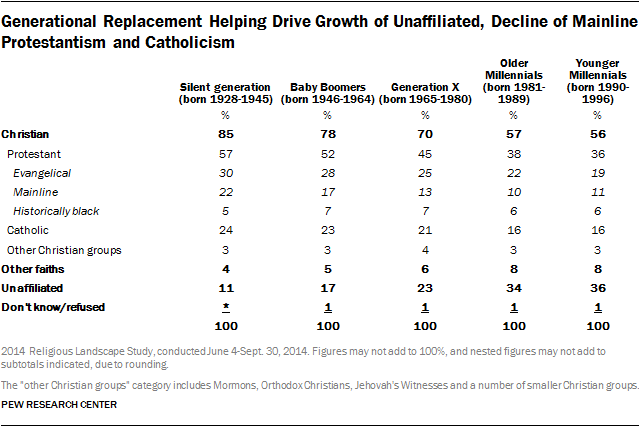 While many U.S. religious groups are aging, the unaffiliated are comparatively young – and getting younger, on average, over time. As a rising cohort of highly unaffiliated Millennials reaches adulthood, the median age of unaffiliated adults has dropped to 36, down from 38 in 2007 and far lower than the general (adult) population’s median age of 46.4 By contrast, the median age of mainline Protestant adults in the new survey is 52 (up from 50 in 2007), and the median age of Catholic adults is 49 (up from 45 seven years earlier). 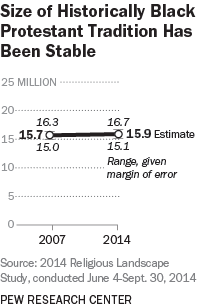 These are among the key findings of the Pew Research Center’s second U.S. Religious Landscape Study, a follow-up to its first comprehensive study of religion in America, conducted in 2007. Because the U.S. census does not ask Americans about their religion, there are no official government statistics on the religious composition of the U.S. public.5 Some Christian denominations and other religious bodies keep their own rolls, but they use widely differing criteria for membership and sometimes do not remove members who have fallen away.6 Surveys of the general public frequently include a few questions about religious affiliation, but they typically do not interview enough people, or ask sufficiently detailed questions, to be able to describe the country’s full religious landscape. In this study, respondents’ religious affiliation (also sometimes referred to as “religious identity”) is based on self-reports. Catholics, for instance, are defined as all respondents who say they are Catholic, regardless of their specific beliefs and whether or not they attend Mass regularly. The unaffiliated are generally less religiously observant than people who identify with a religion. 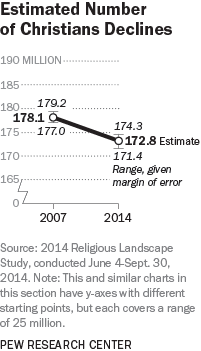 But not all religious “nones” are nonbelievers. In fact, many people who are unaffiliated with a religion believe in God, pray at least occasionally and think of themselves as spiritual people. Forthcoming reports will describe the Religious Landscape Study’s findings about the religious beliefs and practices of “nones” and other groups. For more details on the exact questions used to measure religious identity, see the survey topline. For more on how Protestant respondents were grouped into particular religious traditions, see Appendix B. The Pew Research Center’s methods team provided advice on the sampling plan, questionnaire design, weighting strategy and data analysis. The methods team, led by Director of Survey Research Scott Keeter, includes Research Methodologists Kyley McGeeney and Andrew Mercer, Research Assistant Nicholas Hatley and graduate student intern H. Yanna Yan. Others at the Pew Research Center who provided research guidance include Michael Dimock, Claudia Deane, Andy Kohut and Conrad Hackett. Communications support was provided by Katherine Ritchey, Stefan Cornibert, Russ Oates and Robyn Tomlin. 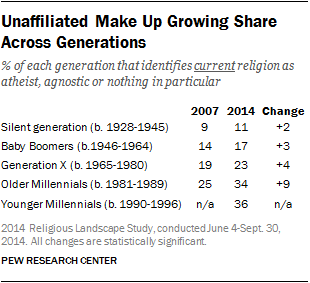 Chapter 1: The Changing Religious Composition of the U.S.